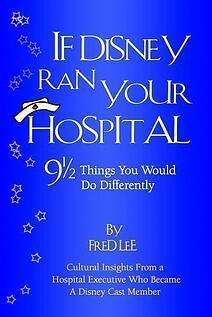 I’ve been reading an incredible book called “If Disney ran your hospital: 9 ½ things you’d do differently” by Fred Lee. Although the book was published 10 years ago and is about human medicine, the messages are highly relevant to modern veterinary medicine. It might be tempting to dismiss correlations between veterinary hospitals and Disney resorts as being far-fetched or simplistic. I disagree, while I’m not suggesting that everything that Disney does would work in our profession, at a high level, their focus on customer (“guest”) and employee (“cast member”) satisfaction is laudable. The first thing you’d do differently if Disney ran your hospital would be to redefine your competition. Everyone who works in your hospital needs to realize that your competition ISN’T simply the veterinarians within your local area: your competition is anyone your clients compare you to. People judge quality by their perceptions, which are subjective and are affected by their entire experience in your hospital. This means that your clients who have been to Disney World or shopped at Nordstrom or Amazon.com are comparing you to them. Our clients have been spoiled by world-class service from these other organizations. What’s one simple thing you can do to make sure you’re “walking your talk”? Adopt the “Four Seasons Rule”: if you come within 20 feet of another person, look at them and smile. If you come within 5 feet of them, smile AND say “Hello”. Remember…it really IS the little things that count. What's worked in your hospital to raise the bar of service excellence?